People have been warned not to disturb a number of "importing breeding colonies" for Arctic and Little terns in the north of the Isle of Man. Last year, several attacks were reported on nesting birds in the Ayres area, according to police. The environment department said anyone who injures, kills or disturbs terns could face prosecution. Research shows the birds make an estimated 50,000 mile journey to breed in these sites. Wildlife experts said species including oystercatcher and ringed plovers also use the area with 300 nests recorded between Blue Point and the Point of Ayre in 2015. Wildlife Crime Officer Mark Kerruish said important colonies will be fenced off in order to try and protect the "vulnerable sites". Arctic and Little terns nesting in the areas are classified as Schedule 1 protected birds under the Wildlife Act 1990. 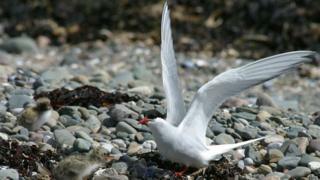 Mr Kerruish said: "Unfortunately, terns abandon their nests when the pressure from people or predators gets too great. "They nest in a limited area and I hope people will respect the controls provided in order to give them the best chance of raising their young." Dog walkers are also asked to keep their pets on a lead in the area of the Ayres National Nature Reserve until 31 July.